Currently, LWPA has 24 members, out of which 13 wind parks owned by members of the LWPA. The total installed capacity of operative wind parks is 314 MW comprising 60 percent of the market. 2.6 MW wind park owned by JSC Dalis Gero, 16 MW and 34 MW – by JSC Renerga, 7,5 MW – by JSC Renerga-1, 9.2 MW and 10 MW – by JSC Vėjo gūsis, 14.9 MW – by JSC Vėjo vatas, 73,5 MW – by JSC Amberwind, 14 MW – by JSC Sudėnų vėjo elektra, 13.8 MW – by JSC Šilalės vėjo elektra, 39.1 MW – by JSC Naujoji energija, 12 MW – by JSC Iverneta, 60 MW – by JSC Šilutės vėjo projektai, 6 MW – by JSC Dolomitas and 1,5 MW – by JSC Žalia galia. 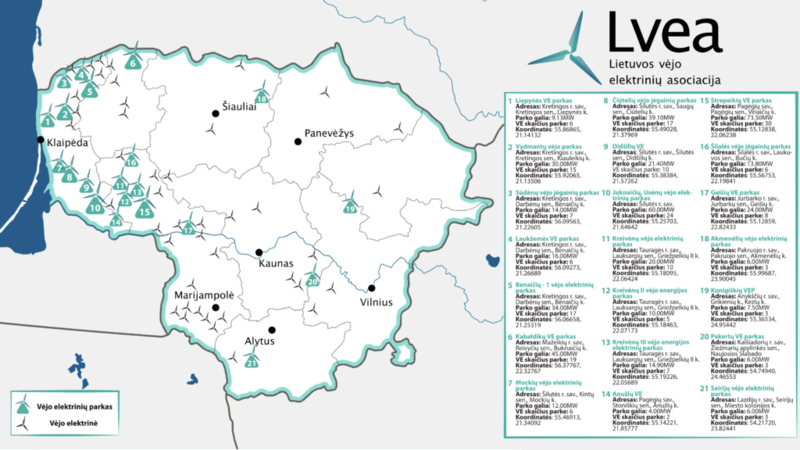 The wind park investments of Lithuanian Wind Power Association’s members are about EUR 800 million. The first, demonstrative Vydmantai wind turbine of 640 kW capacity owned by JSC Dalis gero came into operation in spring 2004. By the end of the year had produced 1.2 MWh of electricity. JSC Vejų spektras was one of the co- founders of the Lithuanian Wind Power Association. Since 2003 JSC Veju spektras has implemented renewable energy projects, applying long term experience and modern technologies. JSC Veju spektras has implemented two major wind power projects in Lithuania, districts of Kretinga and Silute. Total installed capacity of these projects reaches 50 MW. In 2007 16 MW Benaiciai wind farm owned by JSC Renerga began producing electricity near Kretinga. The park produces approximately 44 million kWh of electricity per year. The wind energy park has six V100 2.75-3 type wind power stations. The wind power station equipment was acquired from the Danish company Vestas. Thereafter wind farms owned by JSCs Energopliusas, Energogrupe, Vejo gusis, Vejo vatas, Gemba gradually came into operation. In 2010, the on of the largest object i.e. 34 MW capacity wind energy park Benaiciai-1 owned by JSC Renerga was put in operation. Annually the park produces approximately 86 million kWh of electricity and reduces CO2 emissions significantly. The wind energy park in Benaiciai, Zyneliai and Pelekiai villages, Darbenai township, Kretinga district, has seventeen Enercon E-82 type wind power stations. The hight of one WEP Benaičiai-1 wind power station is about 97 meters. The wind energy equipment was acquired from the leader wind turbine manufacturer, the German company ENERCON. The wind power stations manufactured by this company are among the most modern and most powerful in Europe. An experimental small 6 kW wind and 4.2 kW solar power stations have been built near the wind energy park’s service center. A 2 MW wind turbine’s annual energy production is 4.6 – 5 GWh, while an average household annually consumes 2400 kWh. Therefore, one 2 MW wind turbine could supply electricity to 1900 – 2080 households, while 30 MW wind farm would serve as primary electricity source to a town of about 30 000 citizens. Annual production of a all wind turbines in Lithuania in 2017 was 1,3 TWh. This is enough to cover the needs of more than 1,4 billion of citizens. Wind energy events, latest trends and expert insights. Copyright © 2017 LVEA. All rights reserved.